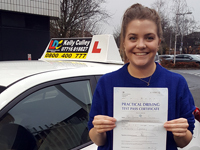 Hi Kelly, Here's my testimonial: After a year’s break of learning how to drive, I was very nervous yet again but also determined to pass my test! Kelly is patient, friendly and she immediately put me at ease behind the wheel. 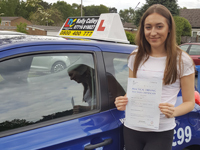 She’s very knowledgeable about the Berkshire areas and those tricky parts of potential driving test routes! Kelly is also flexible in scheduling when needed (times, days and pick up/drop locations) which was great when I am working and had last minute meetings put in that I couldn’t move. The car is good to drive; very light and those electric mirrors are fab especially when learning those bay parks! It’s comfortable with 5 doors and easy to adjust all the necessary parts. 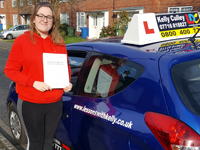 Overall, I had a great experience learning with Kelly which resulted in me passing first time with her. I would recommend her to anyone with any levels of experience. Kelly was a great instructor, very friendly and calm. She helped me greatly with my fear in cars and was always very positive. Her car was great to learn with, a good size and always in good condition. The workbook definitely helped. It is good to have something to prepare for lessons. Somewhere to go to when in doubt and illustrations help make things clearer. Overall I had a very good experience and now feel confident driving. I would absolutely recommend Kelly, thank you so much for everything. Kelly was really easy to talk to and work with. She worked at my pace which helped a lot. The vehicle was really nice and easy to drive. The workbook kept me in order so I knew what I needed to work on. The overall experience was fun and enjoyable. I would definitely recommend Kelly to my friends. Kelly was an amazing instructor. After trying 4 different instructors I found Kelly. She was really easy to get along with and made the whole experience enjoyable. I would highly recommend her. The workbook was very helpfully with the diagrams showing the road positions which helped a lot on my lessons. Kelly was very good, encouraging and patient. The car was always clean and easy to drive. I loved the workbook as it was very structured and easy to follow. My overall experience was very good and I learnt a lot with Kelly's guidance. 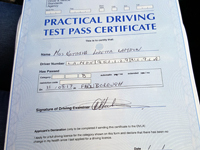 I would definitely recommend Kelly and LDC to anyone wishing to have a great driving experience. Kelly was an amazing instructor, really friendly and understanding of mistakes. The vehicle took a while to get used to accelerator. The workbook was really helpful and had everything in it. I especially liked the section showing reasons for faults and the show & tell questions. My overall experience was good and I really enjoyed learning with Kelly. 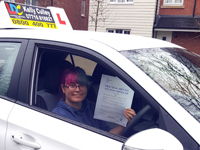 I felt my lessons benefitted my driving learnt from previous instructor. I would definitely recommend Kelly and LDC to my friends.